Your Culinary Adventure: Relaxation & Laughter Organic Farm & Country Side Setting in Chiang Mai Thailand. 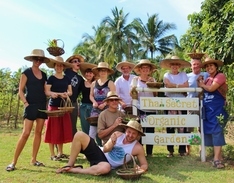 Thai Secret Cooking School & Organic Farm: Chiang Mai, Thailand. A Thai cooking class tailored to comfortably meet every age and skill set. No experience necessary, just bring your smile and camera. Home cooks, professional Chefs, families, old, and young, are the perfect mix to create a memorable and delightful experience together at our country side cooking school. You will learn how simple it is to make your favorite Thai curry’s, stir fry's, sauces, salads, desserts, even some street style, and local northern Thai cuisine. Our cooking school in Chiang Mai, Thailand is located about 20 minutes from downtown. We are in the San Sai district of Chiang Mai, known for its sprawling green rice paddies and deeply rooted agricultural community. We provide transportation from the downtown Chiang Mai area and our school, our day begins with us picking you up at your down town accommodation. if your guest house or hotel is out side of our pick up area we can pick you up at our secondary meeting point Tha Phae Gate. 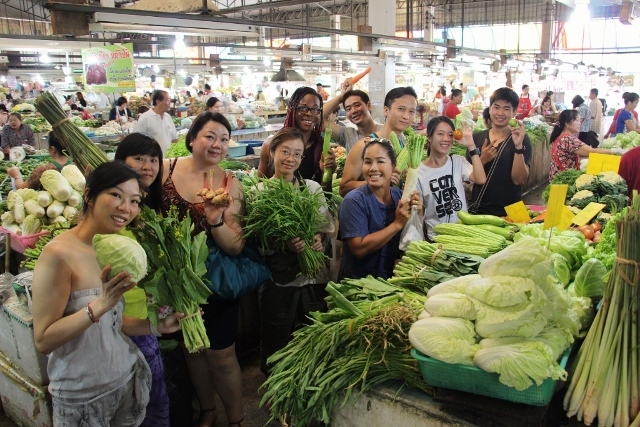 We then tour one of the largest Thai markets in Chiang Mai, the Sam Yaek Market. This is where we shop with the locals and learn about how to choose the ingredients that Thai people and our school uses to cook with. At our school you are greeted with refreshments, then we head out to our beautiful organic garden farm to have a bit of fun harvesting fresh ingredients for our day. A lovely day learning how simple it is to make your favorite Thai curry’s, stir fry's, salads, desserts, even some street food, and local home style dishes. Professional Chefs, Home Cooks, families, old, and young, are the perfect mix to create a memorable experience together in our country side home.